Is the best software that helps an individual or a system administrator control USB storage devices(USB FLASH DISK,USB DISK,IPOD, etc.). 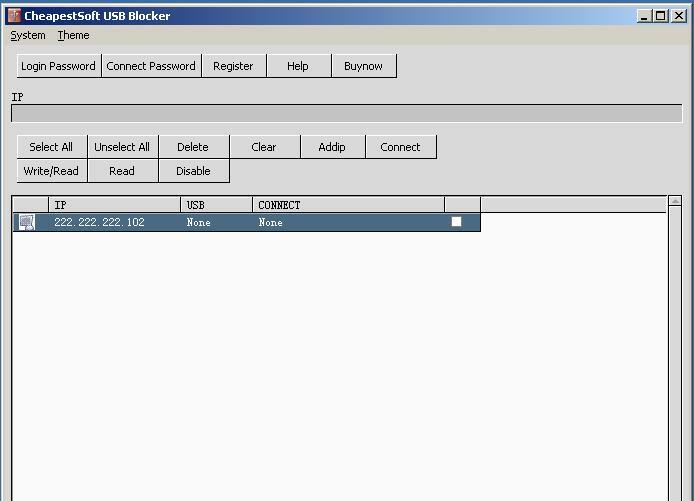 CheapestSoft USB Blocker is the best software that helps an individual or a system administrator control USB storage devices(USB FLASH DISK,USB DISK,IPOD, etc.). You can control a standalone computer or many computers on a computer network. For each USB storage device, you can set three statuses: Disabled (unable to read/write), read-only or Enabled (Able to read/write). You can protect your confidential data from being copied by others or prevent your computers being infected by any unauthorized program or spyware. All the above-mentioned settings will not affect your USB mouse or keyboard. control USB storage devices(USB FLASH DISK、USB DISK、IPOD, etc.). CheapestSoft USB Blocker is the best software that helps an individual or a system administrator control USB storage devices(USB FLASH DISK,USB DISK,IPOD, etc. ).